tips & tricks for King Salmon fishing. 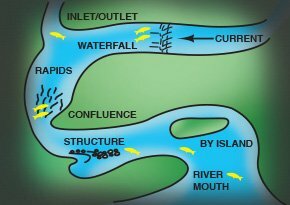 Fish stage at the mouths of rivers and streams prior to moving upstream to spawn. Once in the river, they move into the deeper river channel areas. 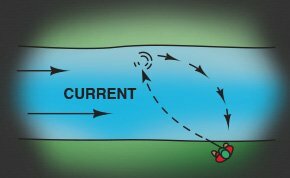 They prefer depths of 3-ft to 8-ft where there is a moderate current. In Alaska, June and July are prime times for river Salmon. In lower latitudes, the Fall run usually occurs in the months of August through September. Salmon prefer to feed in low light conditions. Dawn and dusk, and the hours after dark are best. Salmon prefer spoons, drifting or trolling rigs, and swimming plugs. Cast spoons and rigs upstream, angled away from the bank. Spoons should be retrieved at a speed keeping them very close to the bottom. Rigs should be retrieved to maintain constant bottom contact. Troll both lures against the current. For added attraction, hook skirts, colored yarn, fish scent, or Salmon roe can be added to the back hook of the Drifting/Trolling Rig. Here are some popular approaches to King Salmon fishing. The most effective presentation is to cast or troll a spoon. Fish close to the bottom as that is where river salmon are usually found. Fishermen often use the drift rig with salmon roe, shrimp or other baits. Fluorescent yarn can be tied to the top of the hook for added attraction. Fish in “quartering” a fashion, as shown. Slowly work the lure toward you, retrieving line as you go. Once the lure is past you, reel it in and make another cast. These are ideal places to look for salmon.